I’m not saying anything but i think once the photos are up it will make for very interesting conversation. I can’t decide if I think the feelings will be split or pretty much all one way. I miss all my great audience over there – i know it is a pain to register but I’d love to hear what shots you guys are liking. It is funny that i have become so addicted to shooting and posting – sometimes even though I’m exhausted I cant wait to get back and start working on the shots because i know you guys will like them. . I have had a lot of great moments since I have been here. The best was at Burberry last night. i was going to take a shot of Carine Roitfeld but i was having problems focusing in such lowlight. She was losing patience but I could hear Fabien Baron whisper to her that I take good pictures – that really really made my day. Am intrigued by the Prada thoughts, can’t wait for the pictures to be up! And since you request comments about the style.com: not so keen on the Stella Tennant, although I like the outfit (yeah for yellow! ); but beautiful portraits of Sara Jane and Mario Testino especially, it has real depth. Can’t wait to see your shots at Prada. Miucca’s shows are always so controversial and thought provoking. She’s a visionary in my opinion and some people may disagree but you can’t please everybody. Hurry and don’t sleep til all your shots are posted! Kidding. I love your blog — both your posts and the comments from your “regulars.” I have a suggestion — why not add links to Style.com and men.style.com to your blog when you post new pictures and invite your regulars to continue to leave comments about those images on your blog. Strangely enough, it feels much more intimate to participate in these conversations on your blog; commenting on style.com seems so much more public. Even though you may attract the same audience in both spots, a discussion here about (say) the length of someone’s shirt sleeves has an academic feel, while the same discussion in a “public,” commercial forum tends to feel more like a personal attack on the photo’s subject. Or maybe it’s the feeling that the attention to detail that is so captivating and informative here can seem a bit obsessive in the public forum. Given the size of your audience here, the difference may be illusory, but for me, at least, it is significant. Anyway, just a thought. I love seeing the pictures wherever they’re posted — it is just the character of the commenter’s discussions that seems to be affected. Congrats on the GQ page, by the way — it’s fantastic. Scott, the addiction is mutual–to speak personally, a monkey, albeit a chic one, on my back. …going over to look at Prada. Fabien Baron is insanely talented…getting a compliment from him is a big deal. I think I would faint if Carlos Mota whispered to… anyone that I did a good job on the living room. I just saw the pics from the show and i’m not liking anything at all. The headwraps dont really click with the collection BUT I think the colors were absolutely beautiful. Reminded me of a previous collection from a couple of years ago. ’03 I htink? Could you please add the links to both style.com sites you blog for to your sidebar? That would give you a lot more traffic there, and then maybe could easily click back here and comment if they don’t want to register on the magazine’s sites. Grazzi! carine roitfeld has never looked better than she did in your shot of her during fashion week in nyc. i agree with the comments about posting here vs. at style.com, there is something special about this blog — a quietness, a civility — that is difficult to find elsewhere. i always wander over there to get your take on the shows, but then head on back to base camp share my thoughts and see what others have to say. Can’t wait to hear more. By the way, congratulations on your GQ debut. The issue finally made its way to sunny Singapore. I signed up for style.com so I could post comments over there. It is kind of a pain, but you’ve got some really nice photos over there. I can’t wait. Prada is not always beautiful, but it’s always spot-on. Miuccia really really leads the pack in that she’s always ahead of everyone by at least two seasons. I loved the Fabien Baron when he designed Harpers Bazaar under Liz Tilberis. Their partnership really marked a high point of fashion publishing, in my view. What does Carine look like ‘impatient’? I can’t imagine it – she always look fierce, in the positive sense, of course. Love the Prada (as usual), Vibrant satin, crazy prints, bow necklines & short short short – its all about legs. Oh I love that Carine/Fabien anecdote – you rock! Adore the photo of Mario Testino, the way the lookbook is held up at Kate is genius. Can’t wait to see Prada and Marni. Aah, this type of insights is the reason I’m a Sartorialist devotee. The light on your images is great in deed!! Sorry I haven’t registered to comment at Style.com, but you can be sure I love every shot. Just wanted to tell everyone that is VERY EASY to register on style.com. Gosh Sart, I feel the same way about taking the time to check out your blog each day. Even when it’s late and I’m tired I always have energy to log on before bedtime to check out the new posts. Keep up the great work and thanks for being the thinking-fashion-person’s resource. i agree with the other commenters. there’s something more intimate about here – you’ve really managed to cultivate a community. also, i have to remember to log in at style.com… and it shows my username, in which i inadvertently mistakenly included my name… anyway. as far as the photos – they’re lovely, what’s new? ;-) i especially liked the ones from moschino. some of those were really just invigorating to see, like the woman in the plaid skirt, red stockings, brown alligator (?) belt – wow. and the picture you took at marni of the two women looking at each other, that would be a perfect advertisement for marni! it’s so evocative of that marni aura. in my mind i just see polly mellen saying to prada, “you just made faaashion history dahling.” i thought it was this great collection, kind of threw out everything every had been talking about out the window. it was totally about fashion and most importantly, fun. I’ve checked out the photos of the Prada show, and I’m not a fan of the collection. Even the models looked unhappy. Strange that they’re all (?I think)white. I did like the one skirt with the huge dark disc sequins all over it. But mostly it looks like they were aiming for ugly, and hit it with almost every outfit. I do find M. Prada to be a very interesting woman still though. absolutely THE MOST stunning show. the color, the shapes, the details, the accessories….what can i say…i’m dreaming of spring already. yes yes yes, some very nice and interesting pics this day. za vomen look lovely. I like so many of your most recent shots at Style it’s difficult for me to start. The zest for life of the Moschino series, the fragility of Sarra Jane’s look, the “subject” #3 at Marni… But what I appreciate most is your eye for composition and situations. So the photo with Mario Testino – the picture of three “portraits” – and the Family Day pic are probably my favourites. As for Prada…erm…um… Exciting show? I thought the Prada show was pretty damn good. Miucca knows what she is doing and totally goes against the grain! I look forward to seeing alot of these in Topshop! t wasn’t her best show and you know it and she knows it, but such is the power of Miuccia that even when she’s not at her best women will still want the look. I prefer to think that she’s taking a brake till fall, and I can’t wait. are you still be featured on style.com? i can’t find a link to you. i probably say “loved” far too often but…LOVED the prada. loved the prada, loved the prada, loved the prada. the short, the long, the black, the jewel toned — loved it all, except maybe the fringey bits and even those may grow on me. hmm. i wasn’t into the prada show. satin for summer? and the colors were very fall, and the cut of the clothes seemed awkward. but marni, oh marni…. i LOVED the sportswear sensibility, and the belt on everything… marni was really perfection. the first show this season that i felt did something different, exciting, and right for now. I loved the Prada show. Admittedly it’s against the trends, but I love how its so bold compared to all the other very beige, neutral trend thats happening. ANd thanks for keeping up the good work. You have no idea how comforting and how good a read this is after a long day! I was dissapointed with both Prada and Marni collections. I prefer their fall collections MUCH MUCH more. I’m not bothered by the fall colours at Prada, it’s the shapes that I just couldn’t digest. I think this is the first time i would actually say ‘ewww’ when I’m looking at Prada shows.Hopefully Miuccia Prada do something completely different at Miu Miu. As for Marni, perhaps their fall collection is brilliant, it makes the spring collection looks bad.I don’t like the sports touch on some of the outfits but luckily there are some ‘okay’ ones after that like the white shirt with splashes of red paint on it, the sunglasses are not bad either.I would rather spend more pieces in both Prada’s and Marni’s fall collections and wear it through spring. Now I’m counting on Miu Miu, Lanvin, YSL, Alexander McQueen, Chanel and other Parisian shows to surprise me…in a good way of course! Prada show: Joan Crawford forgets to put on pants one day! I actually reather liked the Prada show, with a few exception. I loved her use of color; very unexpected and I particularly liked the use of the head scarves. PLEASE, PLEASE, PLEASE SHOOT CARINE WHENEVER YOU SEE HER! SHE IS AMAZING! I’m very late on commenting here, but I have to say that after two looks of Prada’s collection, I am disappointed. I can think of three dresses that I thought were fine, but on a whole, I thought alot of her cuts were extremely unimaginative- on the metallic dresses especially (which I think was the only reason metallics were used, to spruce it up). I just saw alot of shapes that weren’t flattering to the female form. BUT, I would love to hear what everyone else thought in response to this, especially the women. Fabien is super nice and what a complement from him! My father use to do photographs for Interview in the 1990s when he was creative director. Very talented. 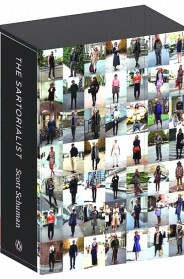 The Sartorialist II Arrives in September 2012! I’m in Love with Berlin!